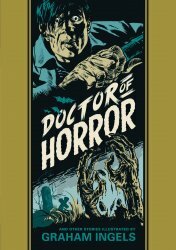 Fantagraphics Books and EC Comics present Doctor of Horror And Other Stories Illustrated by Graham Ingels. Hard cover. 224 pages. EC Horror Comics are famous for their gleefully ghoulish stories and their outrageous twist endings -- served up with a sly wink to the reader and a generous dose of dreadful puns. No artist captured that mood better and made his readers shudder more than "Ghastly" Graham Ingels. Ingels set the standard for fiendishly delightful depictions of dripping slime, dismembered limbs, and shambling corpses. This volume features Ingels" earliest EC crime and horror work, from the pages of such titles as Tales From the Crypt, Haunt of Fear, Crime SuspenStories, and War Against Crime. Highlights in this volume include Ingels" very first EC story, two Ingels adaptations of stories by Edgar Allan Poe (including a clever twist on "The Cask of Amontillado" that you won't see coming), and EC's first adaptation of a Ray Bradbury story. Copyright 2018 Fantagraphics Books, Inc. Hard cover book with 224 pages in vintage black and white. Written by Al Feldstein and Gardner Fox, with Edgar Allan Poe and Ray Bradbury. Shipping Note: This book qualifies for economy Media Mail shipping. However, if your order contains items that do not qualify (anything but books, DVDs, or VHS. Magazines do not qualify because of the ads), then you must either do a separate order or choose a different shipping options.